Garden swings and hammocks are always a lot of fun, and what a great place to take a shaded nap in the fresh air. So get ready to relax and sunbathe this summer with this uniquely designed hammock. 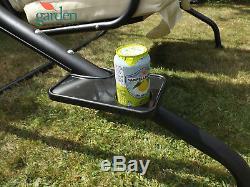 The seat comes with a cup holder on each side so you can enjoy your favorite drink as you swing. The curved steel frame is incredibly durable and sturdy enough to support two people comfortably at the same time. The fade and water resistant canopy with the cushioned seats are made of 180g/m2 to offer you constant shade and comfort. Features:&###x2022;Great convenience with the 2 side cup trays for holding drinks and food. The roof canopy&###xA0;and upholstery are made from quality woven 180g/m2 &###xA0;polyester fabric. 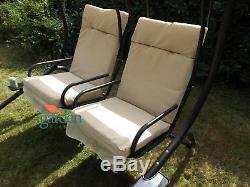 2 seater patio swing with separate swing seats, ideal for deck, patio, garden and more Single Seat Size: 62W x 52D cm. 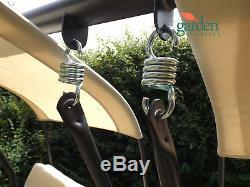 Heavy duty steel construction in powder coating which can hold up to 220 kg in total. Anti-UV and water resistant canopy cover help block harmful rays. Easy-care, easy-to-clean soft cushions with detachable cushion cover&##xA0. Removable seat cushion with waterproof Oxford fabric sub-base. Black powder coated steel frame. 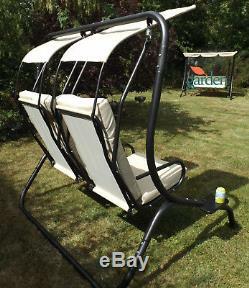 300kg weight limit - this is a three person swing chair. Product Dimension: 170W x 136D x 170H cm. Overall weight 37 Kg - Box size 175.5cm x 65cm x 25cm. Please note canopy should be removed at times necessary to avoid wind speeds of over 25mph. England, Wales & Industrial Scotland. IV, KW1-14, PA34, PA37-39, PH19-41, PH49-50. Denmark, Portugal, Spain, Italy, Austria & Sweden. Rest of Europe 3-5 days. JAKANA TRADING CO LTD is a registered Ltd company. Jakana Trading Co Ltd opened its doors for business early in 2002 and has grown rapidly to become a successful online retailer of items for your home, garden, workshop and leisure. Viewings / Collections by appointment, please call to arrange. Our regular courier collections ensure that they are in your hands in the fastest possible time. We believe very strongly that we should treat every customer in just the same way that we would like to be treated and so this is what we always aim to do. As this is our full time business we are in a strong position to always be here if you need questions answering or if you need customer service. Our office is manned 5 days a week and emails are checked periodically over the weekends. Jakana Trading is a genuine UK based VAT registered business offering quality items at prices far cheaper than the high street. All prices quoted include VAT where applicable. We accept payments by: Credit or Debit Card, simply call one of our sales team Monday - Friday 9.30am - 5.00pm. Sorry but we no longer take cheques as these just take too long to clear. We specifically disclaim any implied warranties of title, merchantability, fitness for a particular purpose and non-infringement. We pride ourselves on our customer service. For more information see our Full Terms & Conditions. You have 14 days from cancellation to return the item to us. This listing is currently undergoing maintenance, we apologise for any inconvenience caused. 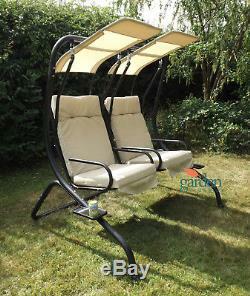 The item "FLORENCE PATIO GARDEN DUO SEAT SWING HANGING SUN LOUNGER BEIGE / BLACK" is in sale since Wednesday, May 16, 2018.